League One side Leyton Orient have signed former Arsenal and Hull forward Jay Simpson on a free transfer. 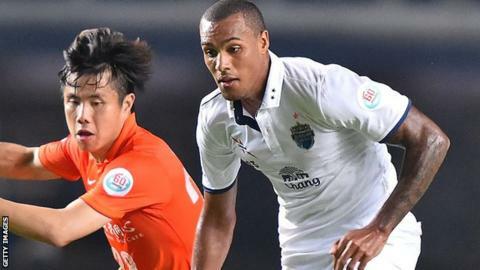 The 25-year-old, who has spent the last year playing for Buriram United in Thailand, has agreed a three-year contract with the O's. Simpson began his career with Arsenal but only made three senior appearances before joining Hull in 2010. "It's a club that is going places and I want to be a part of it," Simpson told the Leyton Orient website. Simpson scored seven goals in 47 games for Hull in 2012-13 before moving to Thailand last September. His move to east London is subject to international clearance. The former England Under-18 international has also had loan spells at Millwall (twice), West Brom and QPR. In total he has scored 35 goals in 187 league appearances in England. Simpson is Leyton Orient's sixth signing of the summer, following the arrivals of goalkeepers Adam Legzdins and Gary Woods, defender Shane Lowry and midfielders Bradley Pritchard and Jobi McAnuff.